As most of you would know I am an avid sock knitter and have been now for some two years. Some would say that I do have an addiction in this department. In saying that though, the feeling of boredom does slightly creep in from time to time. So to curve this, thought I would give shawl knitting a crack. You see I have been seeing all these fabulous shawls being knitted and lovely pictures being posted on Instagram and thinking wow, maybe I should give this a go…. This is where the Find Your Fade Shawl has now come into play. There are so many wonderful combinations out there, that surely I could come up with something as well. Was thinking that as I am still travelling around, I would not have anything in my stash, so would have to wait until I could get my hands on some wonderful yarn along the way. But after one of my Woolswappers Kylie, posted a lovely picture of her’s the other day on Instagram ( you can check out her page here) that was it, my mind was made up. I was going to step outside of my comfort zone and cast the Find Your Fade Shawl onto my needles. Consisted of me purchasing the pattern Find Your Fade Shawl by Andrea Mowry of Drea Renee Knits. With this done in a matter of minutes it was down to some reading of the pattern to see what I needed. Then it dawned on me, that should be able to find enough yarn in my stash to cover this. Upon going through my yarn stash I then came up with the following combination that felt right to me right from the start. Happy with my choice and after posting on Instagram a picture of it and getting a few nice comments saying what a good selection, I casted on my Find Your Fade Shawl. I was happy with the plain knitting first up and then did struggle with the lace part, but once you concentrate (something I am not that good at whilst knitting, I’m afraid) it soon became easier. When I woke up on Day 2, I was so eager to get my needles out straight away. Never mind about the Pure Joy shawl and two pairs of socks that I have on the go at the moment, Find Your Fade was all that I was concerned about. So here is progress on what I managed to do on Day 2. 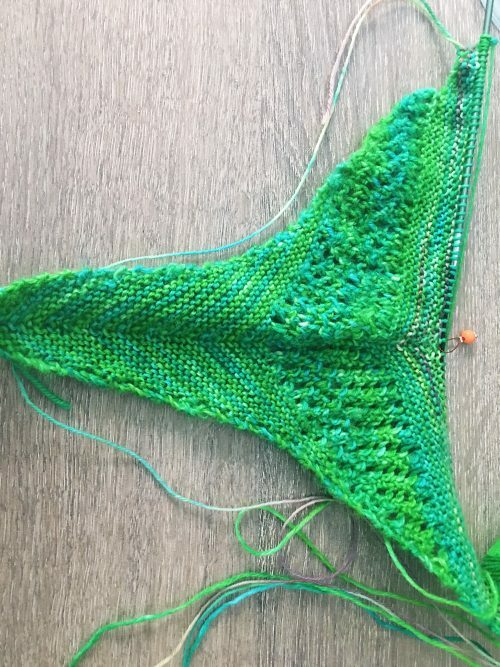 So overall I am happy with my progress on only my second time starting a shawl and stayed tune as will be giving a weekly update on my progress of my Find your Fade Shawl.